initial extraction of must/juice from the fruit by crusher or press. The Extraction window can be accessed from within the Fruit intake console, as detailed in the Managing fruit bookings section here, or directly via Operations – Vintage/harvest – Extraction menu on the vintrace Desktop, Product Overview or the Work Order Writer. You can directly access the an uncrushed fruit intake from the Fruit Intake console, click the down to the right of Arrival and choose Crush/Press. Click on Crush/press now button. The Extraction window is comprised of two distinct areas: Extraction and the fraction details table. Vintrace allows you to select partial amounts of each fruit parcel by specifying the amount to use in the Weight field for each parcel of fruit. Each line will specify the available amount left to extract if it has been processed already. Vintrace allows you to record the break of juice into several tanks at crush/press. This is useful if for example you are keeping track of free run, pressings, or simply want to place the juice into multiple lots or batches. The add line button shown in red above will allow you to add multiple vessels and batches for the juice to be crushed into. The above picture is an example of separating free run and pressings into different vessels. Note the beaker and + buttons. You may use them to request a lab analysis or record additions on that particular fraction. The Additions tab allows you to record additions for the operation, based on weight, and not on the individual fraction. 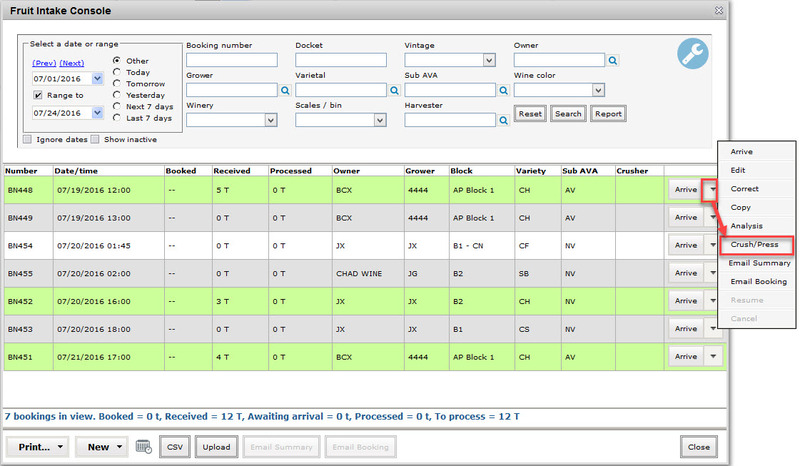 Additions can be recorded and listed on work order for a crush or press operation. Both of these operations have an Additions tab where all additions being made at the must pump or press tray can be indicated and recorded. You may calculate rates per Ton, Pound, Tonne or Kilogram. This section is for information relating to a single load in the crusher/press. Load from booking – the booking containing parcels (fruit deliveries) you wish to extract. Upon selection all those uncrushed parcels received, vintrace will drop them into the parcels list. If you need to crush/press multiple blocks of fruit together it’s best to use the Crush/Press load option – you may need to contact us to have this enabled. Load from crush load – if the Crush/Press load feature is enabled you can select the appropriate crush/press load which will associate the correct fruit to this extraction cellar note – work order. Parcels – add each parcel that you are including in this crush load. Parcels from different blocks, growers can be added. Search by docket number, varietal code, region code or booking number. Fruit process – setup fruit process treatments under Winery Setup > Treatments > Treatments (Crush). These can be used to supply some instruction on a crush/press note. Some common example are treatments that define the procedure for “Destem only”, “Whole bunch press”, “Crush no Rollers” etc etc. This section of the form relates to information for each resulting fraction of must or juice from the crush. These fields will need to be filled out for each fraction before clicking the Add button to add an entry to the fraction list. Batch – destination wine batch for the fraction. Fractions can be placed in different vessels and be associated to the same wine batch. For example, in the case of pressings vs. free run, you may like to keep the two wine components within the same batch but simply store separately. You can create a new wine batch by clicking the New button or search for an existing batch in the system. At the point of extraction, the system converts from weight to volume based measurements for the resulting wine fractions. Therefore, each fraction will require a volume to be calculated – even if just an estimate based on a standard rate of extraction. The volume is coupled with the known weight and both will be displayed to the user. For example, until you take an accurate dip measurement, you will see both an estimated volume and also a weight in tonnes (tons) for a wine in ferment. The three fields used for calculating this amount are weight, rate and volume. You are only required to supply values for any two of these fields before clicking the calculate button to calculate the other. vintrace expects all red grapes to extract, initially, as must. If any other fraction type is selected, you will be warned when saving the extraction operation. Of course, if you are making sparkling wine, it would not be unusual for you to press directly to combined or other fractions – you may just ignore the warning. Conversely, if you are performing on-skin fermentation of white juice and you select “must” as your fraction type, you will receive a warning when saving; you may just ignore it. You will need to do a separate Press cycle later when you are ready to press off the skins. For more detailed information on the musts and pressing off the skins, please click here. Weight (t or T) – the weight in tonnes/tons being extracted for this fraction. The value for this field should take into consideration the total weight of the parcels selected on the left and should be proportional to the extracted fraction. Volume (L or G) – the volume in litres/gallons of the crushed fraction. If estimating this amount, then you are only required to enter a Weight and a Rate (L/t) (G/T) before clicking the calculate button. Dips – If you have dip measurements for the fraction of wine then click the (Dips) option and calculate before clicking OK. This will drop into the Volume field. Note: to toggle between the Dips and the Weight/Rate options, click the (Toggle) option. If you would like default rates configured for the different fraction types, please contact support for assistance. To create a work order for extraction, click on the the Work order from writer option via the File menu. Alternatively, you can click on Work order from from template and use a template to create the extraction work order. To read more on work order templates, please click here. The Extraction form will be displayed in schedule mode and already associated to the new worksheet. Complete as much information as possible about the extraction before clicking Add to work order. Add any additional operations to the worksheet such as Additive or Analysis before clicking Save. The worksheet will be displayed on-screen ready to be printed. By not specifying any fractions, the system will print a blank template note with space for up to three fractions. Tip: there is an easy way to start the crush/press AND put the operation directly on a work order. Find your uncrushed fruit batch in the Fruit Intake console; click the down arrow to the right of Arrive. A dialog box will open, asking if you want to create a manual work order, use a template to create a work order, or crush/press directly – choose Manual work order to create it manually or select Use a template to use a template to create the work order. To complete the work order, scan in the barcode or locate the worksheet via the Job management. The Extraction window will be displayed at this point and you are required to fill in the completed work order. It’s important to double check that the correct parcels are selected and that the total weight of extraction is what you would expect. Match the docket numbers entered on the note to those of the parcels in the list. Select each fraction in turn, completing any missing information before clicking Save to record the operation. Another way to complete a task is by finding your uncrushed fruit batch in the Fruit Intake console, click the down arrow to the right of Arrive. If you have any work orders associated with this booking you will see these listed for completion, alternatively you can create a new work order or just complete the operation without assigning a work order using the crush/press now option.